With superior framework design, retention, and fit, Wironium® is the complete solution for partial denture applications. 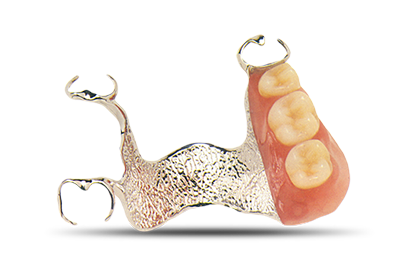 Wironium® partials feature precision fit with unsurpassed functional and aesthetic advantages. Thinner frameworks and the lightweight feel of the alloy bring improved phonetics and taste sensations, as well as a high level of comfort to the patient. When deciding upon a framework design, retention and fit are major considerations. Our Wironium® trained technicians utilize new design parameters, which better distribute bite force and feel more comfortable to the patient. Includes framework, Heraeus Kulzer Artic® Teeth, and True-Life™ setup and finish.